mod_pagespeed and Google PageSpeed Service has been evaluated and from our tests some parts of mod_pagespeed is good but Google PageSpeed Service lags far away. Thankfully Google allowed us this time to evaluate their Google PageSpeed Service and unfortunately, the quality of service of Akamai and NetDNA is far higher up even without any Apache2 mod_pagespeed module. Possible you are aware that, we do have quite good standing point for recommendations for page speed for WordPress. You can search with Page Speed in the search box in this website to get the older results, we will not go in to much detail. mod_pagespeed is an Apache2 Module, although its available for nginx web server. We will take Apache2 as standard as most standard Web Hosts uses Apache2 still now. Rackspace, for all managed configurations adds mod_pagespeed and keeps the over ride on through .htaccess. In other words, you can actually use the .htaccess directives to blow your node more. Its really blowing because it hurts the server. I have doubt how many days a good quality server will live if all the directives are used. It basically pumps the server to give maximum possible output, which basically otherwise can be done in normal way. Its well known fact that, pumping through .htaccess is never a great idea. As always, most common reason of failure is Google’s bad quality server. We pointed out this thing many a times, one example here – Google Should Seriously think for Poor Performing Ad Serving Nodes. There are definitely good points of mod_pagespeed, otherwise we will not give the needed code. The worst point of Google PageSpeed Service is that it is CNAME dependent – you need to delete the A record and add their CNAME value against www sub-domain. You basically need to have a website without any www to non www redirection. It is very bad idea to not use the advantages of Rackspace’s high quality server. That simply means, you have to keep both ways to access your website or must need to have a www named website. If you are looking for one shot setup, Rackspace Managed with Akamai is definitely the best, next is NetDNA’s HTTP caching. This Article Has Been Shared 5405 Times! 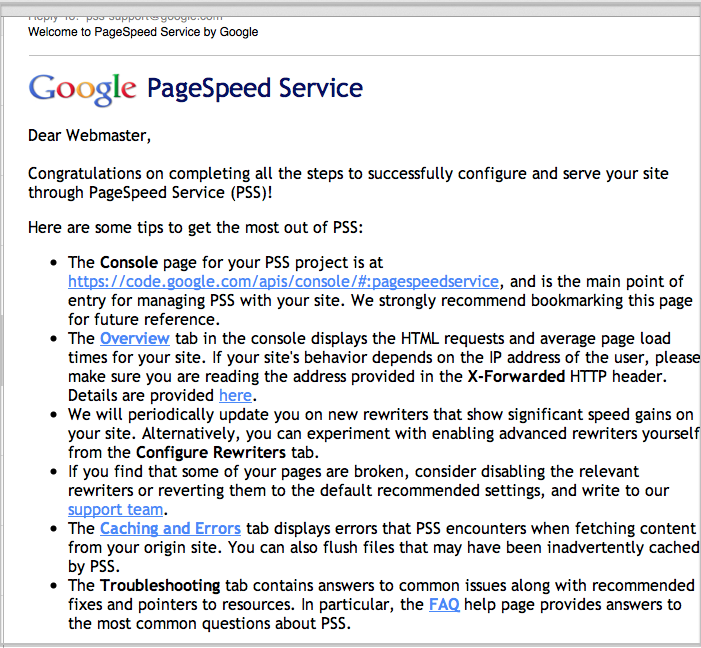 Cite this article as: Abhishek Ghosh, "mod_pagespeed and Google PageSpeed Service," in The Customize Windows, July 1, 2013, April 20, 2019, https://thecustomizewindows.com/2013/07/mod_pagespeed-and-google-pagespeed-service/.